Meet Daredevil Duck. He is afraid of everything. But that doesn’t stop him from DREAMING of being brave. Then one day he is given the biggest challenge of all . 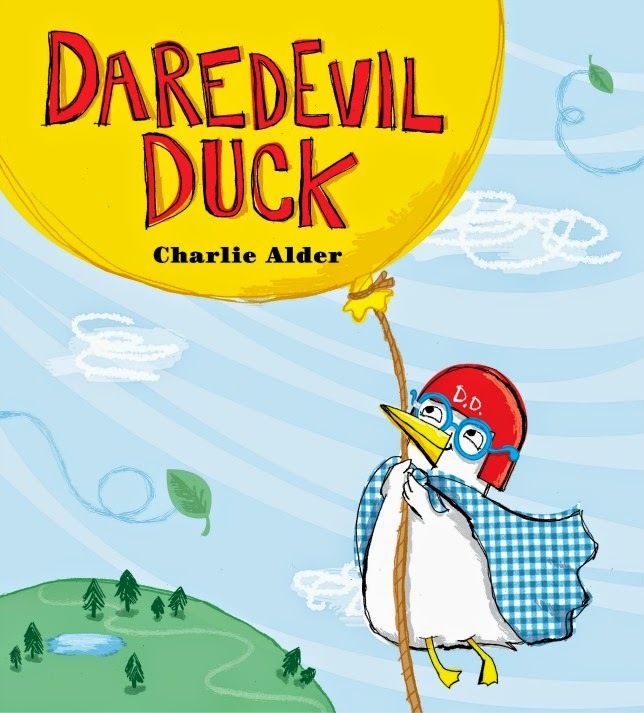 . .
Can Daredevil Duck prove that he is the bravest duck in the whole wide world? The inside flaps and openings help build suspense, and fonts and comic style panels are used to great effect. The bright red blue and yellow used to depict DD are reminiscent of superhero colours, and kids will love the slightly goofy reality. The whole book is visually exciting and I predict kids will love it. If you're interested in finding other books for kids about animals, take a look at Recent Picture Books with an Australian Theme, and Recent Children's Picture Books about Animals. Find more Children's Book Reviews on The Book Chook by clicking Reviews in the right sidebar.